Do brides not wear light brown stoles? So, I'm planning to get married in an ivory & champagne wedding dress on a mountain and I'm wanting to get a light brown faux fur stole to keep me warm. The problem I keep running into is that I've only been able to find furs which are "blush/light brown" (not just light brown). I know the blush color is made to blend well with champagne dresses, but I also know that I've seen plenty of photos of women with wraps that look light brown (without any pinkish tinting). 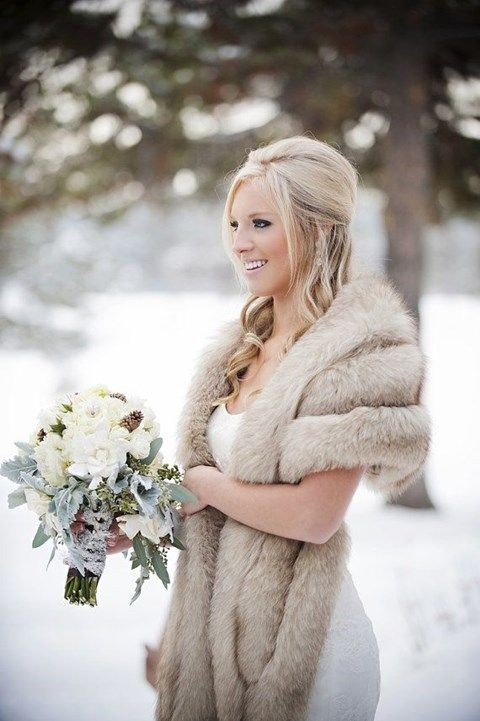 Are those brides actually wearing blush/light brown furs & the lighting just makes it look light brown? Have any of you ever seen faux furs that are simply tan/cream/beige/light brown? Re: Do brides not wear light brown stoles? I wish I could use that, but unfortunately I need to find brown. For the first part of the ceremony the background will be gray (i.e. rocky) so I can't use a gray fur & then we'll be taking a helicopter to a glacier (i.e. snow) for our photo shoot after the ceremony, so I need one that isn't white or ivory because I don't want it to make me completely blend in with the white background (I'm also extremely fair-skinned). Thanks for giving me a suggestion though! I appreciate the help! Have you looked on Etsy? There may be people who can make a light brown faux-fur stole. And of course, there are antiques shops that sell real ones, but I totally get that you may not want these! Where are you looking? I would eliminate any reference to "bridal" or "wedding" in your searches. This. Look for a wrap or stole that is in the color you want. Don't call them bridal. Also, look into the animals that have fur in the color that you want. Then add faux in front of the name and see if that helps to improve your search results.